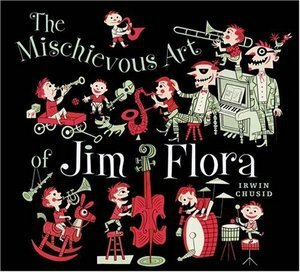 I can't stop looking The Mischieveous Art of Jim Flora. I've had it for about 6 months and I carry it around like some kind of security blanket. I've heard about that but never checked it out - why do you like it? I used to like listening to Irwin Chusid's shows on WMFU when I lived in Brooklyn. Jim Flora's one of the greatest artists I've ever shamelessly ripped-off! Actually, I had a poster from some crappy 'zine that swiped some of his artwork. It completely blew my wig back, so I ripped it off without even knowing who the artist was. Later I got hip to Flora ( whom I believe to be a son of Cincinnati, like yours truly) and I remain in awe of his work. I have that book on my Amazon "wish list" but for whatever reason it still ain't on my shelf. I've known about the work of Flora for years. I even researched a body of it while fishing for ideas for the cover of jewel case I was designing for a jazz/funk band. In the end, for me, it's a little too naif to be on my personal "best of the best" list. But I can still enjoy his limited palettes, whimsical figuration, and genius at complex layouts. Good subject.